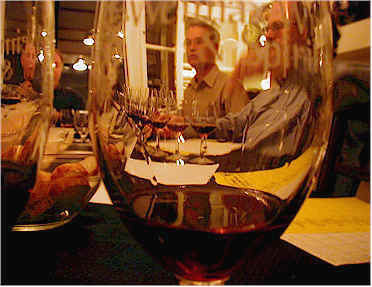 The Vino Fino Tasters took a look at some West Coast Pinot Noirs of recent vintage. A number of 2000 vintage wines are hitting the market, while some wineries are just now releasing their 1999s. We selected a range of wines in the "everyday" to "moderately affordable" price categories. The wines finished with three wines ahead of the pack and two wines at the bottom of the heap. Three wines were numerically tied in the middle! 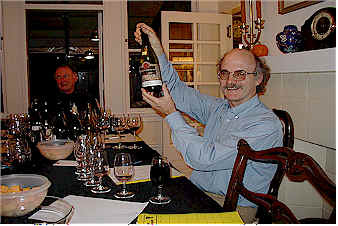 8th Place: ARCHERY SUMMIT 1999 Oregon "Premiere Cuve"
Evaluated in alphabetical order, this wine benefited from the contrasting fragrances between it and its neighbor, the David Bruce. Examined in that context, the Archery Summit wine displayed a floral and almost blackberry-like fruit with plenty of sweet oak. 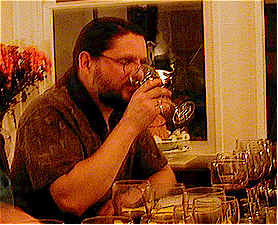 On the palate there are elements reminiscent of anise or black licorice, along with the blackberry fruit. Three to five years of cellaring should enhance and soften this wine. Half to one star rating (3 star scale, zero being "standard quality" or average). I had this noted as being especially typical of good Pinot Noir, showing hints of forest-floor aromas, root-like notes and some sweet oak. The same features are replayed on the palate, with lots of berry and cherry notes and mild tannins. Three to six years of cellaring are warranted here. One star+. Some woodsy notes are the primary fragrances, followed by a hint of a vegetal, herbal streak. 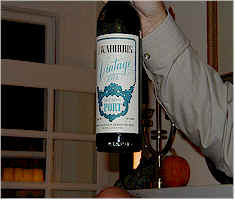 The wine is complete on the palate, displaying the same herb and woodsy notes with a little bit of tannin. Nice fruit, framed neatly by a touch of wood. One-half to one star. Lots of fruit notes here, this is a punch-bowl of ripe, sweet cherry fruit with a bit of candied orange. The flavors are similar with mild tannins and plenty of fruit. A touch of oak adds a nice note. Good. One-half star. Here's a good example of someone attempting to grow Pinot Noir for a budget-priced bottling. The wine has a simple cherry fruit note and oak is not a major part of the theme here. I felt the wine was watery and thin, the vines having been pushed for production at the expense of quality. Ripe, sweet red fruits with a moderate vanillin note and plenty of oak on the nose. This is probably the best "Central Coast" bottling issued by this winery. This is their "entry level" bottling of Pinot Noir. The flavors are woodsy and nicely oaked...I wondered if the wood is American? One star. Lots of berry and cherry fragrances with an appropriate amount of sweet oak on the nose. There's a smoky element, as well. The same notes are featured on the palate, making for a very nice wine. One-and-a-half stars. 1st Place: TESTAROSSA 2000 Monterey "Palazzio"
Light cherry fruit aromas combine with a slightly "root-like" element and sweet French oak to create a very complex nose. There are some smoky notes on the palate with a touch of anise and cherry fruit. This is thoroughly delicious now and ought to remain in good condition for several years. Two stars+. 1975 J.W. Morris Port Works' "Port"